Take Care of Your Shoulders! 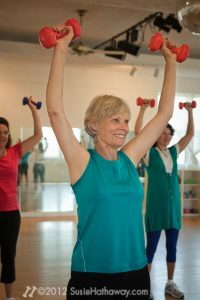 A woman with a torn rotator cuff and Osteopenia recently wrote to ask what moves she should avoid when beginning my Safe Strength Training for Osteoporosis Prevention video. Here’s my reply with tips and personal shoulder stories. My very best advice would be to see a sports medicine doctor and get a referral to a physical therapist (PT) for specific exercises to build up your shoulder muscles—enough to protect your rotator cuff—AND get their advice on if you need to have it repaired. It’s very important to address pre-existing conditions before starting a strength training program, especially with low bone density (Osteopenia). It wasn’t a torn rotator cuff, but I’ll give you an example of my daughter’s experience. She dislocated her shoulder in the 9th grade, downhill skiing. Although she went through physical therapy and was quite strong, that shoulder kept dislocating and giving her pain. Finally, at age 19, her sports medicine doctor insisted that she have surgery for a labrum tear. As far as the safety of my workouts, numerous PTs have seen my DVDs and have given them the okay. 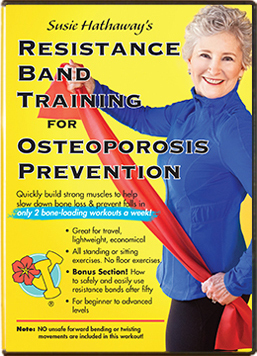 The National Osteoporosis Foundation (NOF) sells them on their website. Doctors in my town send their over-fifty patients, especially those with osteoporosis or osteopenia, to my classes. But, with that said, first ask your PT what moves to avoid. 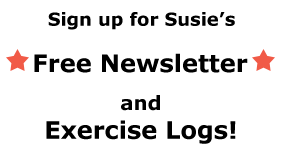 Please see my blog post about the benefits of seeing a PT. I had a shoulder impingement (my PT said it was from sleeping directly on my side) for a couple of years. 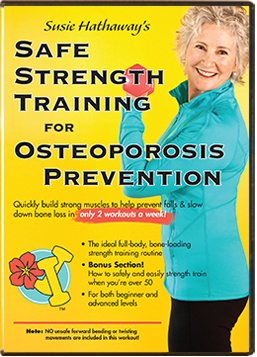 The exercises that I had to skip were the Overhead Press (pictured above) and the Chest Press that are in the Safe Strength Training for Osteoporosis Prevention DVD. You might be different, though, and with your PT, you can go through which moves will help your particular situation and which could harm. Physical therapy worked wonders for me. I’ve seen many women hold off on PT for years and finally go with excellent results. I only had one PT appointment, but kept doing the exercises until my shoulder healed. It took a couple of years to completely heal and it was a process, learning how far I could push it to keep it healthy and out of impingement. Also, not sleeping directly on my side helped immensely. Back Extensions Are THE BEST exercises for Spines! 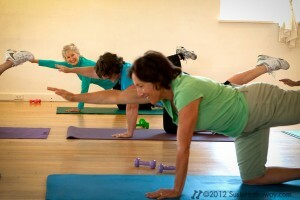 Many of the arm exercises in my video help strengthen the spine. But if your PT recommends that you skip some of the arm exercises, use the back button on your remote control and repeat the sequence of back extensions, which are the best exercises for your back and spine. Embrace back extensions! –my constant refrain. They can be challenging, but that’s because our back sides hardly get any exercise throughout our days and years. Building strong back muscles with back extensions of all kinds will help your posture, strengthen your spine, and help keep you out of the osteoporosis range. You Are Worth the One-On-One Attention! I’m sorry that I can’t give you a simple answer, but shoulders are complicated and professional help, even for one appointment—and even if you have to pay for it out of pocket—can help you stay out of pain and keep your shoulders healthy for life. You are worth the one-on-one attention!! !